MIKHL (MIKHOEL) BURSHTIN (BURSZTYN) (July 17, 1897-late March 1945). Born in Bloyne (Błonie), near Warsaw, his father Yehude-Leyb was a scholar. He attended religious elementary school, and at age thirteen he ran away from home. He worked under difficult circumstances in a lumber yard. He used his spare time for self-study and read a great deal. In 1912 he arrived in Warsaw. He passed the examinations to the eighth class in high school, graduated from a teacher’s course of study, and became a teacher of history and literature. He devoted himself seriously to studying philosophy, psychology, and general literature. In 1931 he published Iber di khurves fun ployne (Over the ruins of Ployne) (Warsaw), 222 pp. (second printing, Buenos Aires, 1949). The publication of this first novel of his led to many warm responses. The mature form of his maiden work received special mention. In the few years that followed, in which he published three new novels, he took a steadfast position in Yiddish literature. He published stories, longer and shorter, earlier in: Haynt (Today) and Moment (Moment) in Warsaw; Forverts (Forward), Tsukunft (Future), and anthologies edited by Opatoshu and Leivick in New York. Following the invasion of Warsaw by the German army in 1939, he left for Bialystok which was occupied by the Red Army. Soviet Yiddish writers sent there from Moscow afforded him a warm reception. Yiddish and Russian newspapers published his short stories. The outbreak of war between Russia and Germany (June 1941) trapped him in Kovno, and he was confined there with all the Jews in the Kovno ghetto. Not losing his courage, he was among the first to call for an uprising against the Nazis. Nor did he cease his artistic works. He wrote Bloye tikhele (Blue kerchief)—plotline: a Jewish mother abandons her young daughter with a Lithuanian peasant woman in order to save the child from the Nazis. He also wrote: Shvalbn (Swallow), Neshome-likht (Light of the soul), and Zelde fun kibart (Zelda from Kibart [Kybartai, Lithuania]), all concerned with the horrors of the ghetto. He began to write a major novel, Di gele late (The yellow patch), a cross-section of Jewish life in Poland on the eve of the war. At the beginning of the summer of 1944, he and two close friends attempted to make their escape. The attempt failed. Soon thereafter the liquidation of the Kovno ghetto took place. Everything that he has written in his years in the ghetto was lost. He was deported, without his wife and child, to Dachau. In the last days of March 1945, in the Kaufering Concentration Camp No. 1, near Landsberg, a divisional camp of Dachau, he was killed (inmate no. 81688). This is the established data that we have concerning Mikhl Burshtin’s end. 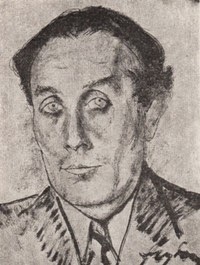 His widow, Rohkl Burshtin (Bursztyn), was living in Tel Aviv. He was one of the finest story-tellers in Yiddish literature between the two world wars; he had his own distinctive style, beginning with Iber di khurves fun ployne, cut short by Hitler. He had already mourned—in Bay di taykhn fun mazovye (On the rivers of Mazovia) (Warsaw, 1937, 185 pp. ; second printing, Moscow, 1941; third printing, Warsaw, 1951)—the fate of the Jews. Other books include: Goyrl (Destiny) (Warsaw, 1936), 207 pp. ; Broyt mit zalts (Bread with salt) (Warsaw, 1939), 284 pp. ; and posthumously, his Bay di taykhn fun mazovye was republished in Sh. Rozhanski’s Erev khurbn (On the eve of the Holocaust) (Buenos Aires, 1970). Sources: Shmuel Niger, Kidesh-hashem (Martyrs), a collection (New York, 1949), pp. 407-9; Yidishe shriftn (Yiddish writings), an anthology (Lodz, 1946); Yoysef Gar, Umkum fun der yidisher kovne (Destruction of Jewish Kovno) (Munich, 1948), p. 379; Sh. Lastik, Mitn ponem tsum morgn (Facing tomorrow) (Warsaw, 1952), pp. 162-68; Y. Volf, Kritishe minyaturn (Critical miniatures) (Warsaw-Cracow, 1940); Melech Ravitsh, Mayn leksikon (My lexicon) (Montreal, 1945), pp. 40-47; Tint un feder (Ink and pen), letters from Mikhl Burshtin (Toronto, 1945); Y. Kharlash, in Foroys (Johannesburg) (February 1938, April 1939); B. Mark, Umgekumene shrayber fun di getos un lagern (Murdered writers from the ghettos and camps) (Warsaw, 1954), pp. 9-10, 208; Rokhl Burshtin (Burshtin’s widow), in Dos naye lebn (Lodz) (no. 16, 1948); Y. Kaplan, in Fraye arbeter shtime (New York) (May 21, 1948); and orally derived biographical information.